In the next 10 minutes I’m going to show you exactly how to research a company before your job interview. You want to go in there feeling ready, and you don’t want to be embarrass yourself. So what’s the fastest and easiest way to get enough information about a company to avoid interview mistakes and make a great first impression? Go to their website and find out about what products or services they provide. What do they sell and how do they make money? Why might their customers or clients choose them? Learn anything you can about the company culture too. Click buttons like “About Us” or “Meet Our Team” when you’re on the company website. Then visit their “Careers” section. Make sure you’re familiar with the job description and take a look at the other jobs they’re hiring for too. This is the longest step in the process of researching a company, but it’ll give you a ton of information you can use in your answers, and knowing more about them will help you explain why you wanted to apply for the job. 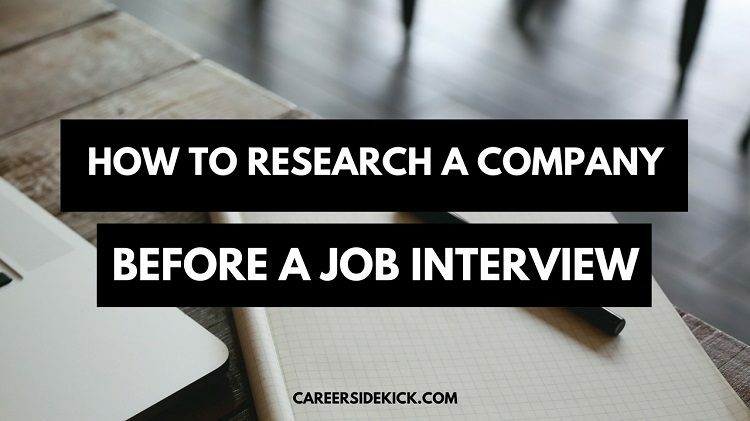 This is a relatively short step, but still important for how to research a company before your interview. Go read some recent developments and press releases to get a sense of what the company is working on. They’ll be impressed that you know the latest news about them. Check out the company’s social media profiles (I suggest LinkedIn, Twitter and Facebook) to see recent news you might have missed on Google News in step 2. You might see pictures of employee outings too, etc. You’ll get a great sense of the company culture and the type of people who work there. If you really want to impress the company with how much you researched them before the interview… head over to similarweb.com, type the company name or website into the search bar, and then find the button that says “similar sites”. Click it and you’ll see companies that are similar to the company you’re interviewing at. Try to find a few key differences and similarities, so you can show you understand the whole marketplace and industry, not just the company you’re interviewing with. If you do this, most hiring managers will be VERY impressed. If you’re interviewing in a new industry this becomes even more important. But it’s a great step for anyone who wants to research a company before a job interview. Search on LinkedIn to find employees of the company. Better yet, find people in the same type of group or role that you’re interviewing for. What type of background do they have? You might spot a trend for the type of person a company likes to hire. You can do the same for the hiring manager. Look them up on LinkedIn. This is a great way to prepare for your interview. You might see something you have in common with them. And if not, you’ll still know more about them than most candidates going in for the interview. So it’ll be easier to bond and build rapport. You can also look for the company on YouTube. Do a quick search and see if they have an account. More and more companies are doing this, so this is a worthwhile step in terms of how to research a company very thoroughly before you talk to them. You might also see their office in a video which will make you more comfortable when you arrive for an interview. You’ll feel like you’ve been there before. Those are the best steps you can take for pre-interview company research. I recommend doing everything above if you have time. When/why was the company founded? Do they have multiple locations? How do they make money? What do they sell? Why do their customers choose them? Use that as a checklist to make sure you’ve researched the company enough before your interview. If you have a question, post it below. And if you have interviews coming up and want to do everything possible to prepare, I created an easy step-by-step method you can follow based on 6+ years working with hundreds of job seekers. You can find out more here.